An abandoned ranch known as Belza Place in the West Block of Grasslands National Park in Saskatchewan, Canada provides a tranquil area for camping. A camper has been parked here as the tourists have stopped to relax before continuing on their journey through Grasslands National Park. Rustic camping is encouraged throughout the West Block of the park but visitors should always be on the look out for the wildlife which poses the most threat such as rattlesnakes and bison. Today, Belza Place and the town of Val Marie, Saskatchewan, a gateway to Grasslands National Park, is sometimes used for all day events where people come out to enjoy music and dancing. Camper at Belza Place - a rustic camping area along the Frenchman River Valley Ecotour route in the West Block of Grasslands National Park, Saskatchewan, Canada. 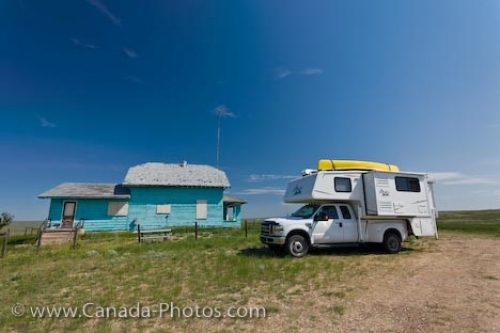 Picture of a camper parked at Belza Place in Grasslands National Park in Saskatchewan, Canada, a rustic camping area.